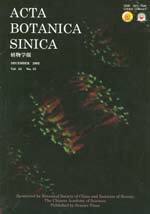 Acta Botanica Sinica, sponsored by Botanical Society of China and Institute of Botany, The Chinese Academy of Sciences, is a leading Chinese journal on plant science distributed monthly to 37 countries. The Journal covers all the major areas of plant science and publishes full-length research papers, rapid communication and review. Since founded in 1952, we have been keeping our readers up to date with the latest science and technology. Database coverage includes totally 44 different overseas index systems, such as Chemical Abstracts, SCI-Search, Biological Abstracts, CAB Abs., Biosis Previews, etc. and 19 in China, such as CSTPC and CSCI, etc. It has been a journal of the top rank among all the scientific and technical periodicals of the biological sciences in China since 1997 in terms of impact factors and total cites, respectively. Acta Botanica Sinica encourages submissions from all parts of the world, and authors of accepted papers for whom English is not their first language will receive help with English expression if this is needed. Authors benefit from fair and expert refereeing. In addition, the Journal offers the high quality reproduction and rapid publication times. Authors can submit colour photographs for possible reproduction on the front cover of the Journal, and in return for the cover’s submission, this paper’s offprint will be given a colour cover. All accepted papers are given immediate exposure on the journal’s home page (www.chineseplantscience.com).